Creative Director for brands such as Mercedes-Benz and White Castle, Saks Afridi, has been bestowed with two Gold Cannes Lion Awards and a United Nations (UN) Award for Peace & Understanding. 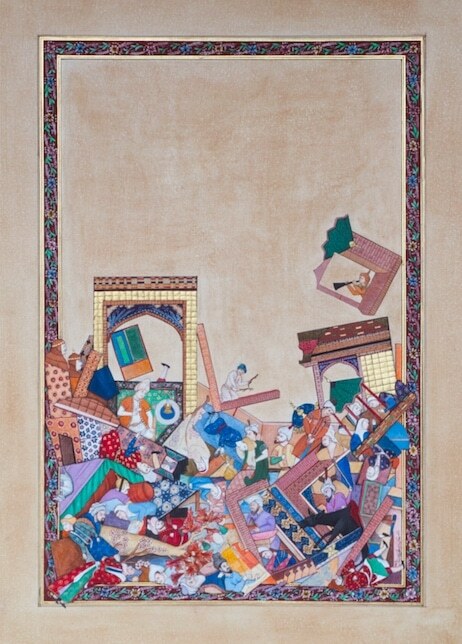 The Pakistan-born, New York living, multi-disciplinary artist collaborates with weavers, painters, and even food vendors to address issues around identity, Islamophobia, drone warfare, and social justice. 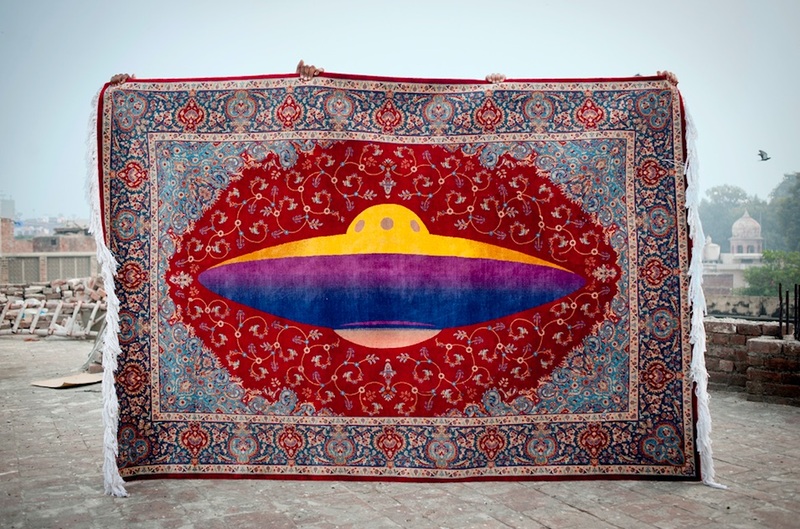 impactmania visited Saks Afridi’s studio in New York where he spoke about his UFO rug, collaborations, the Instagram art market, and eating Jalebi. You are an advertising man. What spurred you to make a Persian rug? The Insider Outsider rug (the UFO rug) started off with this idea of creating a mash-up because I am in two different worlds, but perfectly comfortable in both. There’s no reason for a homeland to be in one place; it could be two or three even. While I speak Urdu and Pashto, and visit Pakistan often, I still feel like an alien there. Truth is, many people living in Pakistan feel like aliens too — it’s a universal feeling. The UFO represents the outsider. The patterns surrounding the UFO represent the insider. The combination of Eastern traditional craftsmanship and Western contemporary sensibilities has led me to this work and a category I refer to as Sub-Continental Futurism. Insider Outsider #1 (2016) handmade wool rug (6′ x 9′) by Saks Afridi. The UFO as the ultimate outsider. Image courtesy of the artist. 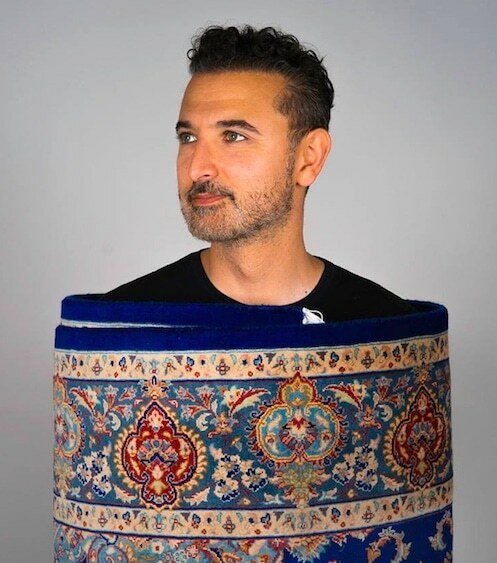 I also designed a Persian rug and then completely broke it down and deconstructed it. The leaves, flowers, and stems are all affected by gravity so everything falls to the bottom. I see it less as destruction and more as rebirth and an opportunity to create something new. Gravity (2016) handmade wool rug (6′ x 9.5′) by Saks Afridi. Image courtesy of the artist. Then you worked on miniature paintings. What was the process for developing this very traditional art form? Yes… India, Pakistan, and Iran are known for this. I started researching miniature painting… There is an amazing school in Lahore called National College of Arts (NCA), which produces some of the best miniaturist in the world. … They learn by repetition — copying the masters… I started doing some of that, and I realized it would take me years to get this painting to a level I needed to get at. That’s when I started applying what I do in advertising — that is finding the right people to collaborate with. Just as I found the right weavers for the rug making, I could find the right miniaturists. I reached out to a curator, then a gallery director of the nonprofit Twelve Gates Arts in Philadelphia. They connected me with a miniaturist in Lahore, a fellow Pashtun named Kausar Iqbal. What do these traditional artists think when you come and show them something that has such an untraditional design? I have to explain it to them. I insist that they understand and know what it’s about because otherwise, they’re just a vendor making me something. I want them to be true collaborators and feel what they’re making. I’ve gone and spoken to the weavers and painters to get the concept across. However in the case of the gravity miniature painting, I designed all of it in Photoshop; I printed the designs and did tracings and outlines over them. After that, Kausar Iqbal traces it and then formally paints it, applying his personal style. All these pieces take time. 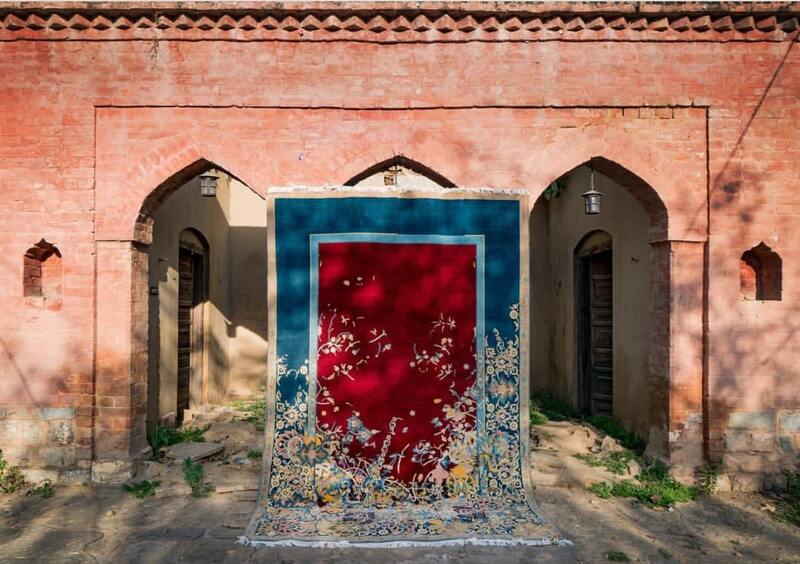 The rugs take about nine months to make. The painting took about seven months to make. What I love about these collaborations is that they give work to artists, artisans, and craftsmen in Pakistan. In the case of this painting, for example, it’s a complete collaboration. The costs and earnings are divided equally — that was a big deal for Kausar. It was an eye-opening experience for him; realizing that a collaboration can generate work and money. Give me something, Kausar, the miniaturist said about the collaboration that stayed with you. Being an artist is financially challenging; being an artist in Pakistan is even harder, especially if you’re not in the right art circles. Kausar struggles by choice. He can work for his father, who runs an electronics shop, and make a decent living. Instead he chose to raise his family through art. It’s very brave and admirable to make a living as an artist in Pakistan, or anywhere for that matter. So he teaches, and that gives him the income of a teacher. He does have art shows in Pakistan and overseas, but it’s difficult to survive as an artist. As an artist navigating the New York-art world, that is a desperate thing to say, but I understood his situation. So I brought the painting back to New York, photographed it, and posted it on Instagram. Within 12 hours, it was sold to a collector in Saudi Arabia. Gravity miniature painting by Saks Afridi and Kausar Iqbal was sold over Instagram. Image courtesy of the artist. What has been surprising for you to learn doing all of this work? I love it when the artists I collaborate with take the work and elevate it. That means that what you have in your head and what eventually comes out are two different things. You need to be open and allow for that to happen in collaborations. It’s surprisingly freeing. Has there been any resistance from people since you are working with a traditional medium and a traditional process? Not at all; there’s a lot of that happening in the arts in Pakistan. Artists are really breaking barriers right now with edgy contemporary work. Traditional artisans also want to break the mold and make new things. So I’d say it has been the opposite of resistance. I interviewed an artist recently; she said that the art piece an artist creates holds value, but the artist’s time, process, and labor does not have value. People who collect and turn it around make more money than the artist. What is your thought on that? In the art market, the artist always makes the least amount of money. 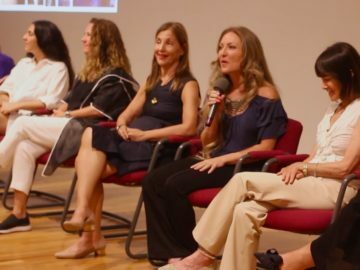 Things like provenance, the right gallery representation, and art dealer connections — all of these things are important and add to the value of the work. But yes, I could show you countless of pieces that are considered of great value but are not great work. People forget that a lot of time goes into making art — the process of making the work is the art — especially if you look at writing as an art form, research, or conceptual art… The process is the art, how do you put a value on something like that? For example, how do you put a value on land art? I worked on a piece with four artists, including the French artist JR, about drone warfare in Pakistan. The piece was called Not a Bug Splat. That’s technically a land art piece. It received over 2 billion impressions online and $200 million worth of free earned media. It was seen everywhere, but does it have a dollar-amount value? Not really. The impact was enormous. For a while, there were less drone attacks in the area, correct? Yeah, after our installation, drone attacks went down from over 1000 to 0-2. It definitely had an impact. Admittedly there have been attacks since; they are a lot more careful and selective about it. Drone attacks have become evil tools for governments. They can’t avoid it; it’s just the way that warfare is conducted now. We can bring it to the forefront and get people to question it. The artists’ job is simply to put questions forward. I’ve been asking many interviewees about belonging. Tell me a little bit more about what belonging means to you. I live the life of an ‘Insider Outsider’. This is the practice of achieving a sense of belonging while being out of place and finding happiness in a state of temporary permanence. I grew up moving countries every two to three years. My dad worked for Pakistan Airlines. I had to change countries, houses, schools, languages, and cultures, on a regular basis. It taught me and my sister to adapt and adjust without losing who you are at any point. I remember being in South Africa as a 16-year-old, after apartheid had been lifted. Mandela just been sworn in, and South Africa opened itself up to the world…I’m fortunate because I’m ethnically ambiguous. So, I’ve never faced any kind of racism, whether it is in New York, South Africa, or Dubai. I’ve seen racism in all three of these places, Dubai especially, towards Indians, towards Pakistanis. I was just not cool with it. There were occasions where I had to speak up and made it stop. The creative ad teams in Dubai are primarily of South Asian origin; they’re mostly Indian and Pakistani. 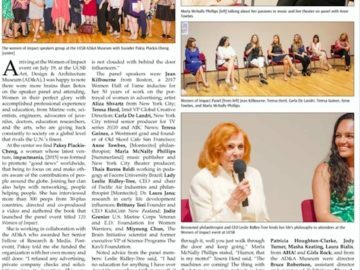 While most of the senior creative directors are Arab and American. I speak English, Hindi, Urdu, and Arabic. When management would have a conversation in Arabic, I wouldn’t feel left out. Then at the same time, I can go down to the studio and talk to the retouchers in Hindi. These were the guys that would come up with all the ideas and the concepts. We would stay up all night doing all the work. When it came time to present, they could present perfectly well, but I was always sent because it made for better theater. I understand advertising is a world of theater. I get that in the U.S., as well; I have Midwestern clients that don’t want any strange names in the room. In Dubai, you hear the racism in Arabic. You have to make your own identity and make your own belonging. 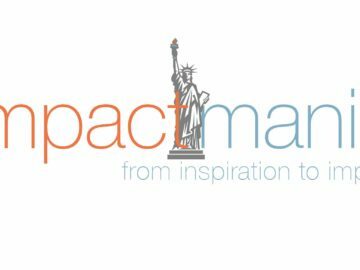 What are your thoughts on what is needed for social impact? Balls! [Laughs.] 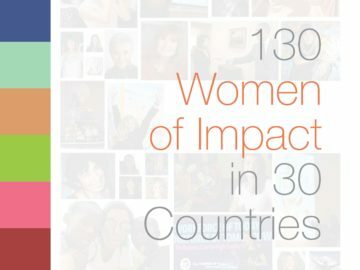 We live in an age where opportunities to make social impact are great; unfortunately, the need for social impact is also great. But money talks and it can silence many voices. Not a Bug Splat was very much a social-impact project. 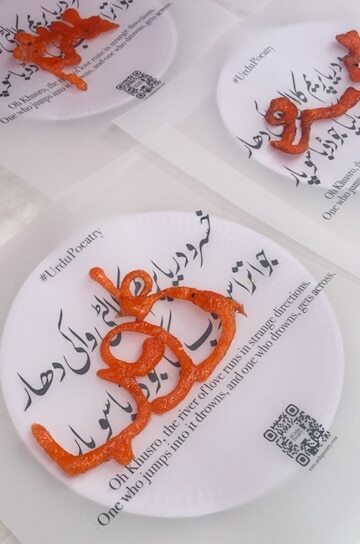 Another social-impact project I recently did was the Jalebi Poetry project in London with another artist, Ali Rez — I’m not sure if you ever had this Indian dessert called a Jalebi. It’s orange, and it’s circular like spirals. The Karachi Literature Festival was happening in London. We had this idea of commemorating Urdu poetry and poets and make a statement by remembering the depth and sweetness of the Urdu language. In India, Hindi is getting lost. In Pakistan, Urdu is getting lost. We took Jalebi batter and wrote deep fried sweet poetry with it, so people got to actually eat poetry. It was tricky! Once we figured it out, it was easy. Did the lettering stay on a piece of dough? You have to write it out on a flat surface first and then carefully dip it into the oil. Once the form cooks, it holds. It is then dipped into a saffron and sugar syrup, and then it’s ready to eat. What was one of the poems? “Oh, Khusrau, the river of love runs in strange directions. One who jumps into it drowns, and one who drowns gets across.” ~ Amir Khusrow. Amir Khushrow’s poem made of Jalebi. Image courtesy of the artist. Nobody else had either; BBC and Geo News reported on it. You and your wife, Comedian Suzie Afridi, are both artists in a household. Do you talk projects with each other? We do, we do. Suzie wakes up at 5 a.m. in the morning and writes. Usually by the time I get up, she’s talking a mile a minute. I’m trying really hard to keep up while I’m having my morning tea or coffee. Our son Zidane has his colorful commentary going on in the background. Morning times are interesting in the Afridi household. We dedicate separate times to work on her comedy. We’ll have comedy dates where she’ll go through her material. I’ll listen to it and give her thoughts and suggestions — she sometimes takes them! Suzie is more of a conceptual person and a words person. So I’ll show her my work to get a visceral reaction. Suzie woke you up in the middle of the night and said, “I want to be a comedian.” You got up with her and started Googling classes and courses. You are the first husband / wife that I’ve interviewed. It is pretty cool that you are pursuing your individual passions but are also a team. Suzie also watches Arabic TV, so she has her finger on the pulse of Middle Eastern pop culture. She’ll give me references based on what people are thinking in the Middle East. She gives me ideas all the time. It helps having a person to bounce ideas off, and not worry about it being half-baked, or even just a fleeting thought. The sooner you get rid of those insecurities, the better. Instead of giving a fully formed thought, I believe in the vulnerability of giving a partial thought and letting it bake in conversation. This doesn’t just apply to a spouse; I believe in sharing ideas with the world and not being precious with them. 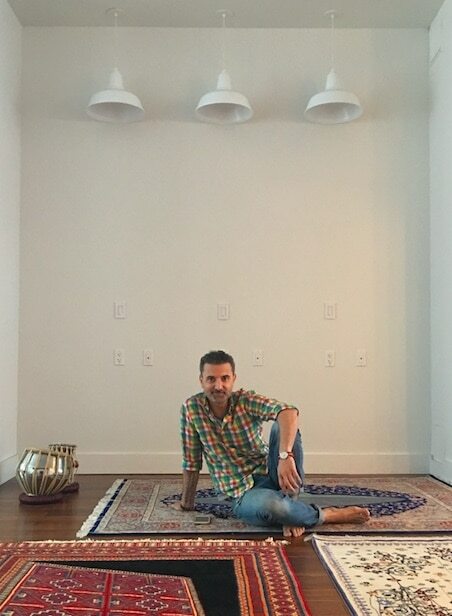 Saks Afridi at his studio, New York, NY. Photo by impactmania. Within the art world, a sculptor that I love is the Palestine artist Mona Hatoum. I absolutely love her work. Ed Ruscha; Olafur Elisasson; and I like Daniel Arsham’s work too. Give me somebody who helped you become an artist, besides Suzie. What do your parents think of you being an artist now? I asked him, “Baba, you have to go over the mountainside and get this written for me.” So he goes in the heat, talk to people, and try to get them to write things out for me. He will say to me, “Listen, you’ve got impossible projects — writing poems on a Jalebi.” But as always, parents make it happen. You’re training him to become an artist!